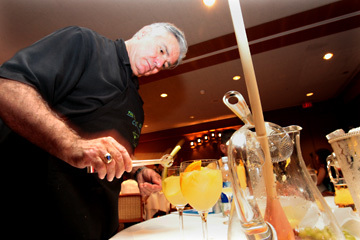 Dale DeGroff puts the finishing touches on some yummy glasses of sangria. Devotees of famed bartender Dale DeGroff will be disappointed to know that their secret is out: DeGroff's spirits seminars at the Halekulani combine the best elements of wine tasting and culinary instruction. Only they're a lot more fun. June 21: Cocktails of Cuba, 6:30 to 9 p.m. Cost is $50. June 24: Cocktail brunch with Bloody Mary Bar, $75. Classes are limited to 30 participants. For reservations call 931-5040. At Thursday night's "Viva Espana -- Sangrias" class on Halekulani's Garden Terrace, the atmosphere turned festive in a hurry. Those who signed up in time to get into the class (procrastinators get relegated to the waiting list) started with a glass of sangria -- prepared by DeGroff -- so refreshing and smooth that every well-garnished drink disappeared quickly and made fast friends of people who had just met. Round tables set with vodka, wine, pitchers, ice and wooden "muddlers" to mash fresh fruit forced strangers to collaborate on the perfect summer cocktail. DeGroff circulated through the room offering advice and amusing feedback. What about the ratio of each ingredient? He shrugged. "You know, it's not an exact science. 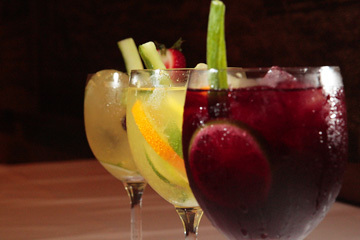 Sangrias shouldn't ever be dead bone dry. But don't worry about the instructions. Just have fun." He also tasted and rated the three different variations each group created. At the end of each batch, he declared one table the winner, which spawned cheers from the victorious circle and inquiries from occupants of other tables. Did they use more sugar? Mash their fruit -- apples, oranges, lemons and limes, anything goes -- more effectively? DeGroff's sangria class on Thursday night was one of many in the ongoing cocktail series at Halekulani, where DeGroff has served as the Director of Beverage Arts for the past 18 months. "He gives you so much information and background," said Honolulu resident Susie Lindner, who was attending her fourth DeGroff seminar. "Cocktails do have a history." Furthermore, "it's a good dining experience. And it's very entertaining." Everyone appreciates the recipe DeGroff sends home, but the opportunity to experiment in an interactive environment is an essential component. "We're more wine people, so we don't know about cocktails," said Mirella Monoscalco, a member of Chaine des Rotisseurs, a gastronomic society. Her husband, Mark, added, "it's a whole different world we really aren't aware of." They have attended all of Degroff's classes because, Mark said, "Dale is the center of the cocktail universe. And every class is very unique." Emergency room physician Dr. Sid Lee said that he and his wife learn something new each time. "If you have questions, he has all the answers," said Lee. Now that Lee's wife is pregnant, DeGroff makes a special effort to prepare virgin drinks for her. BECAUSE HE IS based in New York City, the 57-year-old DeGroff offers two classes per month at Halekulani -- usually in the same week. His book, "Craft of the Cocktail," was published in 1992 and is still in print. He travels around the world training bartenders and serving as a consultant for specialty drinks in upscale hotels. When he worked at New York City's Rainbow Room, DeGroff invented 400 of his own libations. Since then, he has also created some original drinks for Halekulani. After he finishes his instruction, he can often be found tending bar at Lewers Lounge. Recently nominated for the prestigious James Beard Wine and Spirits Professional of the Year award, he said modestly, "I guess I've become a little more than a bartender." His basic philosophy centers around "getting away from all of the mixes and shortcuts." DeGroff's drinks use only the freshest ingredients -- one practice that sets him apart. Even a steep learning curve didn't dampen students' enthusiasm for conversation, multiple helpings of elegant hors d'oeuvres or liberal samples from pitchers on other tables. In one group, the first hands-on attempt elicited a question: Why isn't this one as good as the drink he served us when we arrived? "I don't know," laughed San Francisco resident Kim Dale. "Maybe because we made it!"